Jonah, being a sign anticipating Christ’s death and resurrection, is, according to Jacques Ellul, actually in hell (Sheol, ” the realm of the dead”). But this is exactly where he experiences the grace of God, even if he has not yet seen deliverance. I’m currently working on a sermon on ‘the sign of Jonah’ in Matthew 12:38-42. Jesus makes it clear that “just as Jonah was in the stomach of the sea creature for three days and three nights, so the Son of Man will be in the heart of the earth for three days and three nights”. This suggests that the book of Jonah is quite relevant for understanding the gospel. How are we to understand the song that the prophet Jonah sings at the bottom of the depth? Some possible answers may be found in Jacques Ellul’s book on Jonah (I hope to make use of it when finishing my sermon, we’ll see). 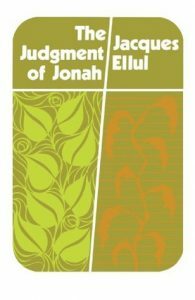 Jonah, being a sign anticipating Christ’s death and resurrection, is, according to Ellul, actually in hell (Sheol, “the realm of the dead“). But this is exactly where he experiences the grace of God, even if he has not yet seen deliverance. What Jonah realizes is that God’s grace is both eternal and permanent, even when it has not been recognized as such. In this way Ellul develops a core theme in dialectical theology, where God’s ‘yes’ is always implicit in his ‘no’, his mercy in his judgment. “Jonah, even while he is not saved, even while he is at the nadir of his misery, in hell, suddenly rediscovers the permanence of grace: “I called to the Lord, out of my distress, and he answered me.” Jonah has not been answered if we take the answer to be rescue from the belly of the fish, salvation from hell. But he has been answered if we take the answer to be adoption under the care of God who takes on the totality of our sufferings, dramas and situations. He is answered because grace does not fail in any way, and even if there is no visible, actual and personal sign, Jonah can state that the answer takes place because grace has been granted to him from all eternity. Jonah rediscovers this grace of God at the very moment his situation is hopeless and to all appearances nothing more is to be expected. His refusal and flight were clearly outside grace. Events have taken place without any indication of a favorable intervention, only signs of judgment. But suddenly, when he has accepted his condemnation, when he has acknowledged before God that he was guilty and that God was just, he sees that at no point did God cease to show him grace. Under condemnation in hell he finds the faithfulness which permits him to say: “Thou hast answered me.” In his return to God he comes to know God again. There is no bargain: “I repent and so you show grace.” God has been gracious from the very beginning. He does not change when man returns to him. He simply brings to light his hidden mercy and makes his general and eternal benediction near and actual. In all these twists, in this debate, in the fall of Jonah, grace has never left him. Quite the contrary! But it is in hell that he really comes to take account of it.” (Jacques Ellul, The Judgment of Jonah (Eerdmanns 1971), pp. 48f).